Classical in style, the Thompson Collection boasts a timeless appeal that will enhance the beauty of any bathroom. Tasteful detailing enriches the sophisticated aesthetic that includes the choice of either a Charcoal Glaze or French White finish. A solid wood frame, dovetail construction and Black Bronze hardware speak to the quality craftsmanship of this collection. The Thompson 48-inch vanity features ample storage with 7 functional DWRs and can be matched with one of our natural stone tops to create a functional and fashionable centrepiece to your bathroom. The Foremost Ashburn 48 in. Vanity Cabinet Only in Mahogany has a large interior storage area and 3 drawers that offer versatile options for storing toiletries, bottles and other bathroom and household items. Made with solid wood, natural wood veneers and clean, low-emission engineered wood, this sturdy vanity cabinet is finished in a rich mahogany colour and decoratively accented with rectangular oil-rubbed bronze hardware. Enrich your bathroom ambience with this upscale 48-inch mahogany vanity that is more affordable than it looks. With a rich, dark finish and a clean, sleek profile, this modern piece has an understated elegance that will impress homeowners and guests alike. Two large cabinet doors with soft-stop bumpers and three right-side drawers open up a bevy of storage options for linens and bath essentials, setting the tone for a tidy powder room. The sturdiness and craftsmanship of this vanity cabinet will make you think it is custom-built, while small details like leg levelers instill confidence for perfectly stable setups. Gaze through the Foremost Ashburn collection for complementary mahogany items like wall cabinets and mirrors for a complete bathroom makeover. 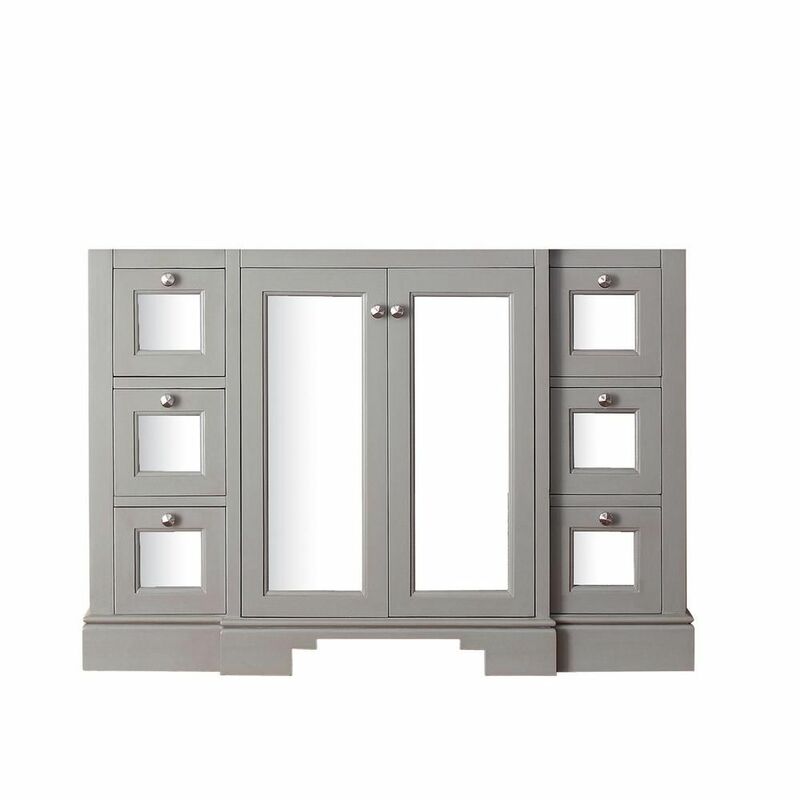 Newport 48-Inch Vanity Cabinet in French Grey The Newport Collection combines classic design with dazzling mirrored accents, producing a vanity rich in style. Featuring six drawers and a large central storage compartment, the Newport vanity provides plenty of storage space within its 48-inch frame. The French Gray Finish adds a touch of old-world elegance to Newport's transitional lines. You can add a handsome Carrera white marble top and white vitreous china rectangular undermount sink to create a smashing vanity combo. The coordinating mirror completes the look.